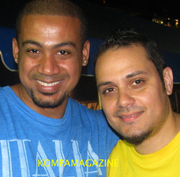 ROBERTO & TI REGI SEND LAST MINUTE MESSAGE TO T-VICE & DJAKOUT FANS..HOURS BEFORE THEIR OKAP KANAVAL SHOWDOWN! *ROBERTO MARTINO'S MESSAGE TO VICE NATION! *TI REGI'S MESSAGE TO DJAKOUT NATION!